← Into the Belly of the Beast: Bringing Kauai’s Story to Syngenta World Headquarters Annual Shareholders Meeting April 28th. From Kauai to Switzerland – Why we went, what we accomplished and what’s next. I spoke from the podium directly to the Syngenta Board of Directors and the nearly 1,000 Shareholders in attendance. My message was clear and unambiguous. I asked them to withdraw from their lawsuit against the County of Kauai, to honor and follow our laws, and to give our community the same respect and protections afforded to the people in their home country of Switzerland. I pointed out that their company Syngenta uses highly toxic Restricted Use Pesticides (RUP’s) in our community, including atrazine, paraquat and 4 others that they are forbidden by law from using in their own country. As you can see from the video, Fern Rosenstiel, a Kauai resident who traveled to Basel with our small Kauai delegation was filming my presentation when she was approached by Syngenta security and told to put away her camera. She complied but when they tried to take her camera she refused to give it up and resumed filming as they escorted her from the hall. Syngenta also prevented the local television news station and a French film crew from taking camera’s into the meeting. How was I able to speak inside the Syngenta shareholders meeting you might ask? 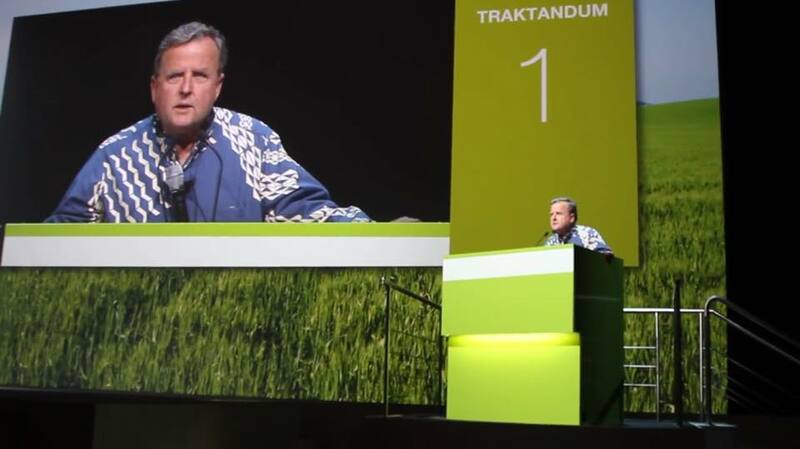 The Swiss organization that invited the Kauai delegation to Switzerland is MultiWatch http://www.multiwatch.ch/ (Google will translate), and they own one Share of Syngenta stock. MultiWatch transferred or otherwise assigned that Share to me giving me the legal right to enter and speak. To be clear, Syngenta did not want me there and was working on many levels to prevent me from speaking but legally there was nothing they could do to stop me. MultiWatch is an incredible Swiss NGO and they are advocates for environmental, labor and social justice interests connected to Swiss Trans National Corporations that are bad actors in other parts of the world. The delegation from Kauaʻi included Hawaiian cultural educator Mālia Kahale‘inia Chun, environmental scientist and co-director of Ohana O Kauaʻi Fern Rosenstiel, as well as myself. While in Switzerland the Kauaʻi delegation also met with local and national Swiss lawmakers resulting in the Social Democratic Party, the largest political party in Basel, issuing a Statement of Support, asking Syngenta to “honor the democratic process and protect the people of Kauaʻi.” These meetings also resulted in several articles in Swiss Newspapers, television news and Swiss Public Radio covering Syngenta’s activities in Hawaiʻi and the Kauaʻi residents’ concerns. Our small delegation made several presentations to a European alliance of environmental organizations, trade unions and political parties tracking the activities and impacts of Swiss transnational corporations around the world during a conference held April 24th & 25th. We embarked on our trip to Switzerland at the invitation of MultiWatch who was aware of the Kauai Bill 2491 and the growing movement in Hawaii. Our primary goal was to educate this international audience on the cultural and historical context of Syngenta’s operations on Kauaʻi, the impacts of the industry’s activities, and the political and social efforts of the community to gain environmental and public health protections (i.e. through Kaua‘i Bill 2491 and state bills such as HB1514). We also spoke of the similar battles and lawsuits underway on Maui and in Hawaii County. The issue on Kauai is simple really. Syngenta and the other international chemical companies need to drop their law suit and comply with the duly passed laws of our County putting into place modest buffer zones around schools, hospitals and homes and fully disclose all pesticides use – as per Ordinance 960. We are not going away and we will not tap out. So long as these companies continue to disrespect and disregard the wishes of our community, we will continue the battle to make them comply. Syngenta conducts heavy applications of Restricted Use Pesticides on Kaua‘i and sells RUPs containing atrazine and paraquat for use around Hawai‘i –pesticides which are banned in their home country of Switzerland. In addition, Syngenta has extensive acreage of open-air genetically-modified test crops on Kauaʻi, while cultivation of GMOs is banned in Switzerland. The Hawai‘i Alliance for Progressive Action (HAPA) http://www.hapahi.org supported the trip to Switzerland at the invitation of Swiss non-profit “MultiWatch.” As the volunteer President of the Board for HAPA, I want to thank all in the community and around the world who helped make this trip possible. We are presently contemplating partnering with our friends around the world and conducting similar actions in other countries on every continent. We are also exploring the possibility of hosting an international conference of our own here on Kauai – at ground zero. Shining the light on activities of the international agrochemical industry and expanding that global discussion is an important tool that we here in Hawaii need to leverage. By inviting others from around the world who share our experience, plus bringing in science, medical and agricultural experts to share their knowledge, is a natural path and key role Kauai and all Hawaii could play in this critical international debate. To host such an international conference will require partnerships with other organizations and funding support. If you are interested in helping to move this idea forward please contact me soon so we can begin building the team it will take to make this happen. This entry was posted in Uncategorized and tagged County, Gary Hooser, GMO, Hawaii, Kauai, maui, multwatch, pesticides, switzerland, Syngenta. Bookmark the permalink. 9 Responses to From Kauai to Switzerland – Why we went, what we accomplished and what’s next. Mahalo Gary, Fern, and Malia for standing up for Kauai. I hope that they will listen, understand, and demonstrate fairness. If these chemicals are banned for use in their own country they should stop using these chemicals here on the Hawaiian islands. Thank you Gary and every one who share their concerns and efforts to heal the People on Earth with awareness and knowledge.